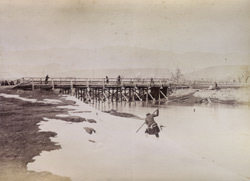 This photograph was taken, c.1879 during the course of the Second Anglo-Afghan War (1878-80) by the Bengal Sappers and Miners, an engineering arm of the Indian Army. The Kabul River rises in the Sanglakh Range in eastern Afghanistan and flows past Kabul city into north-western Pakistan. The river valley has long served as a thoroughfare between the two countries and Alexander the Great used this route to invade India in the 4th century BC.